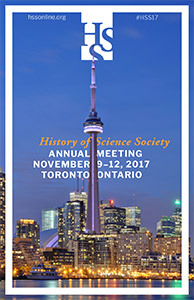 The History of Science Society’s annual meeting hosts over 750 of the world’s most dedicated experts in the history of science. Sponsorship offers an excellent occasion to reach the eminent scholars, passionate professors, and zealous enthusiasts in the field. A wide variety of sponsorship and advertisement opportunities are listed below. We are also open to additional sponsorship initiatives. Inquire here. Please note that the Philosophy of Science Association will be organizing this year's book exhibit. If you're interested in booking a table for the 2018 meeting, find more information on their website. 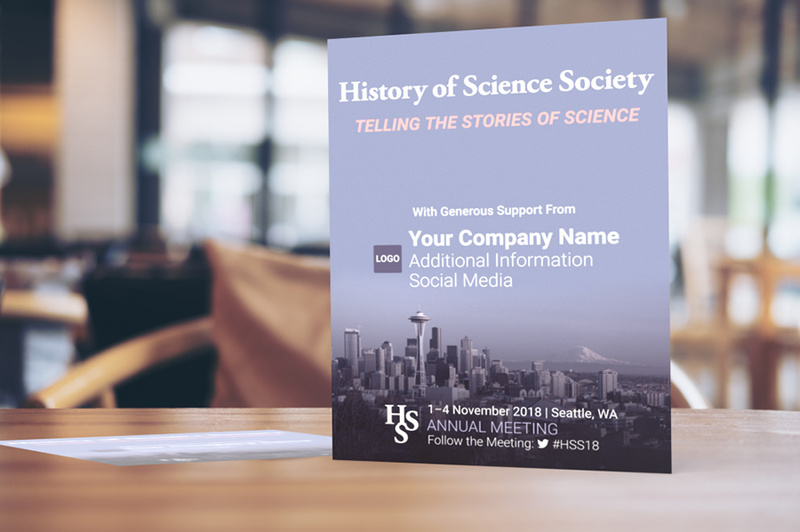 Our basic sponsorship package allows you to show your support for the history of science with a low cost of entry while still offering high exposure for your company. The 2017 meeting website generated over 16,000 page views, and we project this year’s meeting website to top 20,000 page views. With this package, your company name and logo (with additional description if desired) will be included on the meeting website front page and sponsor page. After purchase, sponsors will be provided with a link to submit logo and other required information. Want to make a great first impression? Make your promotional materials the first thing our attendees see when checking into the meeting. Packet inserts are distributed to every attendee (over 750 expected) at meeting check in. 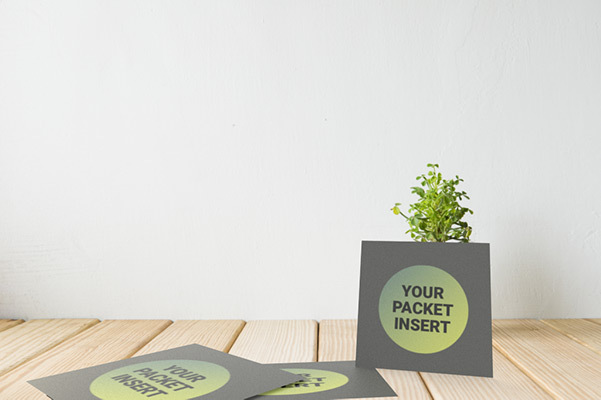 The design and form factor of the packet insert is up to you (as long as they fit into a 9" wide x 12" high envelope or folder). After the investigation of science history, our attendees are most passionate and vocal about coffee (and to a lesser extent tea). Fuel these scholars’ minds by sponsoring a coffee break at the 2018 annual meeting. Attendees will be forever grateful. A new, exclusive offer! 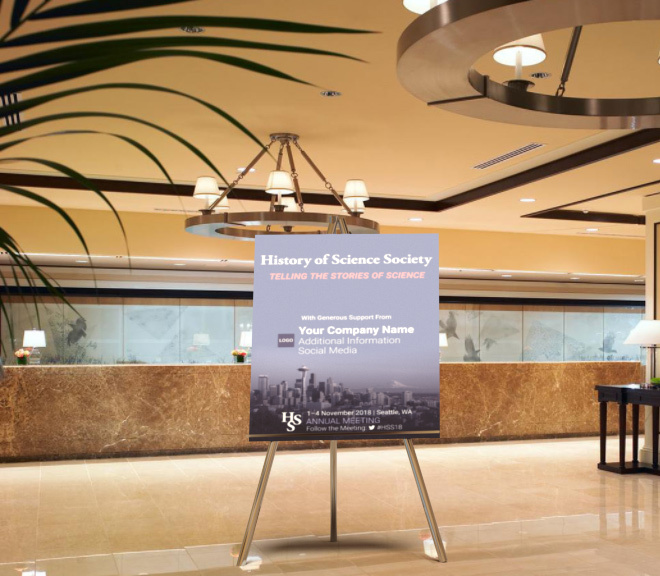 Reach the most dedicated scholars in the history of science through a banner ad on our meeting website. The site is projected to receive over 20,000 page views by the conclusion of the meeting (4 Nov 2018). After purchase, sponsor will be provided with a link to submit ad as high-resolution image (JPG or PNG measuring at least 1000px wide x 200px high). 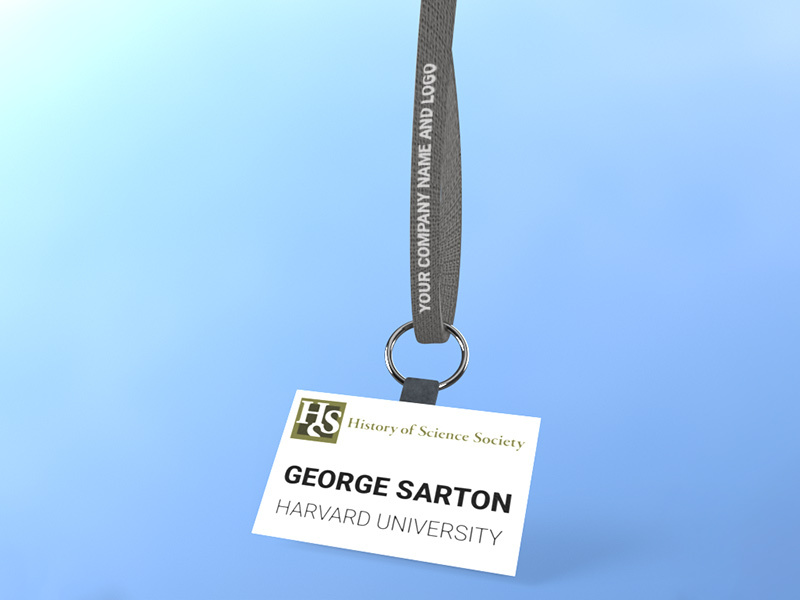 Stand out at our annual meeting by sponsoring customized lanyards, branded with your company name and logo. These lanyards hold the name badges that our 750 attendees brandish with gusto. After purchase, sponsor will be provided with a link to submit logo and other required information. After a long (but enjoyable!) day of papers, attendees look forward to the food and festivities of our meeting reception. Help welcome them to this event by sponsoring it. Easels will be displayed prominently to communicate your support of the event with your company’s name and logo, and any additional information you would like to include. After purchase, sponsors will be provided with a link to submit logo and required information. Help deliver our meeting materials in style! These customized folders will feature your company name and logo, with the addition of any other information you would like to communicate. Every attendee (projected attendance of 750) will receive this folder upon check in. 750 custom printed meeting folders, featuring your company name and logo with other details, to be distributed to all meeting attendees. It is impossible to overstate how essential Wi-Fi is to our attendees. Descartes or someone else said it best: if I’m not online, then I might as well not exist. By sponsoring our attendees’ connection to the internet, you will be providing the meeting’s lifeblood. Located near the registration desk, (2) easels will communicate your company’s sponsorship of the internet. Attendees have reported that the program is their most cherished resource for the meeting. It’s frequently consulted, checked, rechecked, and perused. With a projected attendance of 750 attendees, program advertisements promise to reach a wide and passionate audience. The meeting program will be published in print and digitally via the meeting website, further increasing the reach of your advertisement. Ads must be 4.25" wide x 7" high. After purchase, sponsors will be provided with a link to submit ads as high-resolution PDFs and other required information. 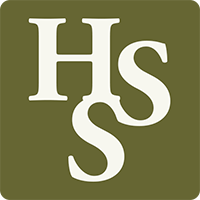 The HSS Newsletter is a quarterly publication distributed to our 1800+ members and available to the general public. We promote the newsletter via the HSS website, social media, and email. 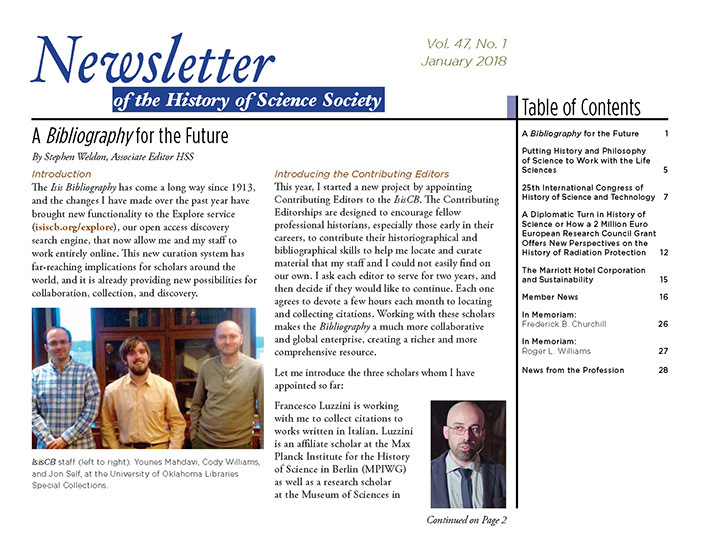 The newsletter contains stories on issues in science history as well as news of the profession. See the latest newsletter. Newsletter advertisements are a fantastic opportunity to reach our loyal readership before and leading up to the annual meeting. After purchase, sponsors will be provided with a link to submit ads as high-resolution PDFs and other required information. Order before 1 June 2018 to get advertisement run in both July and October newsletters! Choose your sponsorship package below and click “Checkout.” You will enter payment information on the next page. Once your order is processed, you›ll receive a confirmation email containing instructions on how to submit logo and any addditional necessary information. 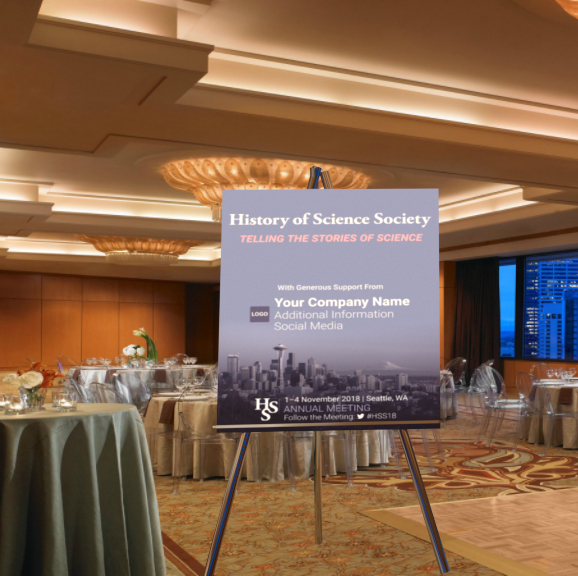 Your sponsorship is guaranteed to make a significant impact on scholars in the history of science. No sponsorship package found or all packages may have expired. 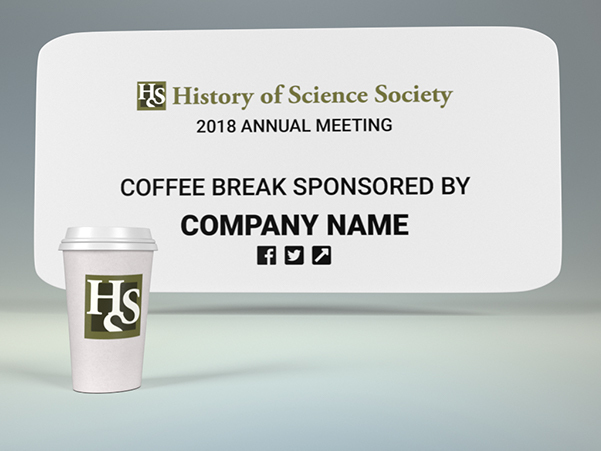 The History of Science Society will generally refund sponsorship package purchases if purchase is before 1 October 2018 or that package's booking deadline, whichever comes first. The Society reserves the right to waive refunds on a case by case basis. The Society cannot provide refunds on sponsorship packages that include physical meeting materials where those materials have already gone to production (including but not limited to customized folders and lanyards).